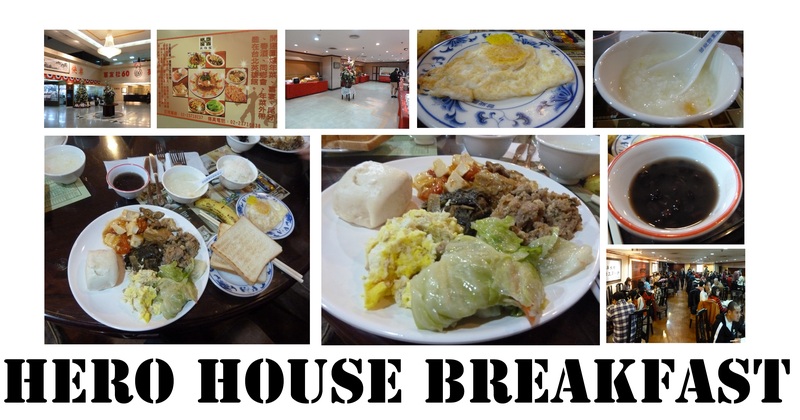 A Swiss friend, knowing that i love to try different Taiwanese breakfast, invited us to the Hero House, which is a place for the old Taiwanese soldiers and where they can get advantages and other stuff. On the second floor for example, they have a restaurant for breakfast. For 100 TWD, you can eat as much as you want. I love this concept that we don’t have back in France. So at 7am, we were there, with the soldiers, politic men (there is the presidential house just next to it), and the old people. Yeah, we had to wake up at 6am to be there on time, so this is quite an adventure to get a breakfast in Taiwan. The buffet is composed of scramble eggs, plain eggs, steam bun (mantou), congee (rice soup), pickles, toast, butter, jam, soy milk, cabbage, rice, tofu with tomatoes, fried tofu, meat in small pieces, bananas and another veggie (don’t know what it was). And you can serve yourself as many times as you want. The food is ok, but not that good. It’s a nice change, if you want to try something different, but i prefer the usual one. Anyway it was a nice experience. Another one, another kind of Japanese. I prefer this one: cheaper and hot food which is perfect with the current weather. 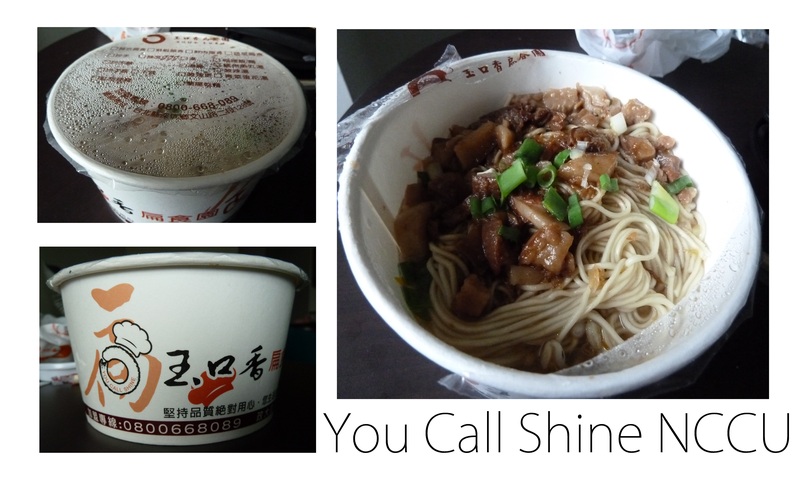 It doesn’t propose expensive food with bad quality, you have a big bowl and a cheap price= perfect for students. 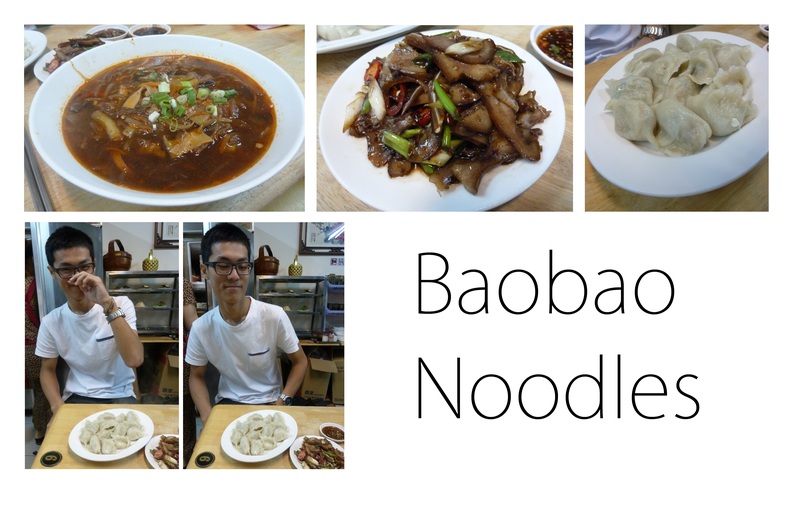 Benjamin brought me to his favorite noodle restaurant called Baobao (in the small street on the right side from the main gate). They’re good at dumplings and i tried his favorite dish, with was a spicy seafood noodle soup. And he made me try Pork’s ears (yeah, i tried Pork’s ear and ate cartilage!). The dumplings were good, i liked them. The soup was really spicy but nice too. Just the noodles really looked like spaghettis, so it was a little bit strange, but it was nice. And well, the pork’s ears…if you don’t try cartilage it’s ok, just like normal meat, but i really don’t like the crispy side of the bones. Benjamin bought the ears so next time it’ll be my treat! My favorite is still the left hand restaurant and the korean one, but this one is good if you want dumplings! Finding a cheap restaurant in Zhongxiao fuxing is quite difficult i think. You can find a lot of trendy places and western restaurants, but when you don’t want to spend too much on a diner or you’re just hungry enough, it’s quite difficult. However i managed to find a little place selling noodles. The cook was really nice, he gave me some extra food freely (maybe because i was a foreigner). I tried some big noodles that i had never seen before, and they were ok. Howver the fish balls were not really good. And the pickles were nice too. But for 80TWD compared to the 160TWD coffee i had just a street behind, it’s pretty good.